This is a brave and generous thing to say. If you’re not able (or committed enough) to do the reading before you give your opinion, please have the guts to point that out. I have always had a mind for *trivia, though it has diminished with time. As a kid in the ‘80s I cleaned house at Trivial Pursuit and aced those name-and-date history tests in school. Thanks more to my smartphone than my age, I don’t hold information like I used to, but I still have some "useless facts” stored. I also have a lot of books on a lot of bookshelves. Combine these two things and I may seem like a smart person, well-informed and able to speak into many different subjects; but the truth is, I haven’t done all the reading. I love learning, but I’m an amateur (from latin, amare—to love) in the best sense of the word: one who participates in something for the love of it, rather than as a profession. I love learning and thinking and I believe it’s important for Christians to “do the reading", but I don’t know All The Things very deeply. I have the tendency to read headlines and feel as though I’m informed, and I also have a big creek to cross when it comes to articulating, verbally, what I do know. I have been guilty of showing up to a conversation, a meeting, a group, without having done the work. My solution is to ask good questions. People who have done the work appreciate an opportunity to share what they know, and as long as I do the current work of being honest (“I didn’t do the reading…”) and aiming to participate and glean as much as I can during the conversations, I can ask good questions that will inform my future work. But if showing up without doing the reading becomes a pattern in my life, it’s usually a sign that I’ve overcommitted or under-prioritized. Showing up regularly unprepared diminishes the benefit of the group for all involved, not just myself. Doing the work also applies in church. The weeks when I purposely read ahead in the text before going, I am much more in-tune with the teaching. I pay better attention during the sermon, take better notes, have better questions and find better answers. I’ve done the work. I don’t do this often enough, but one thing writing does for me is it holds my feet to the fire of my own convictions; I’ll be doing more reading ahead for Sundays. The main point is that we need to be honest and curious about what we don’t know. The only place to learn from is a place of humility. I know only this much leaves room for growth, and sometimes even what we do know will be deconstructed as we willingly hear other informed opinions. I’m currently mapping out my reading for the new year, compiling lists and plans and work for my own personal education. I’ve called this my Homeschool MFA because all my reading, listening, writing, and thinking is aimed at being a better reader, listener, writer and thinker, the way I think a legit MFA program would be. Maybe you have no interest in being a better writer or reading more books, but couldn’t the world benefit from more Christians who were thoughtful, informed, compassionate, and able to speak truth articulately? If you think your corner of the world could use that, I’d be happy to have you join me in this (non-trivial) pursuit. I’m re-working my current, dormant newsletter, and tailoring it to fit these goals. It will probably continue to go through some changes—I generally learn best from hindsight, unfortunately—but to begin with I’ll be including links, lists, and thoughts from what I’m reading, watching, and listening to. 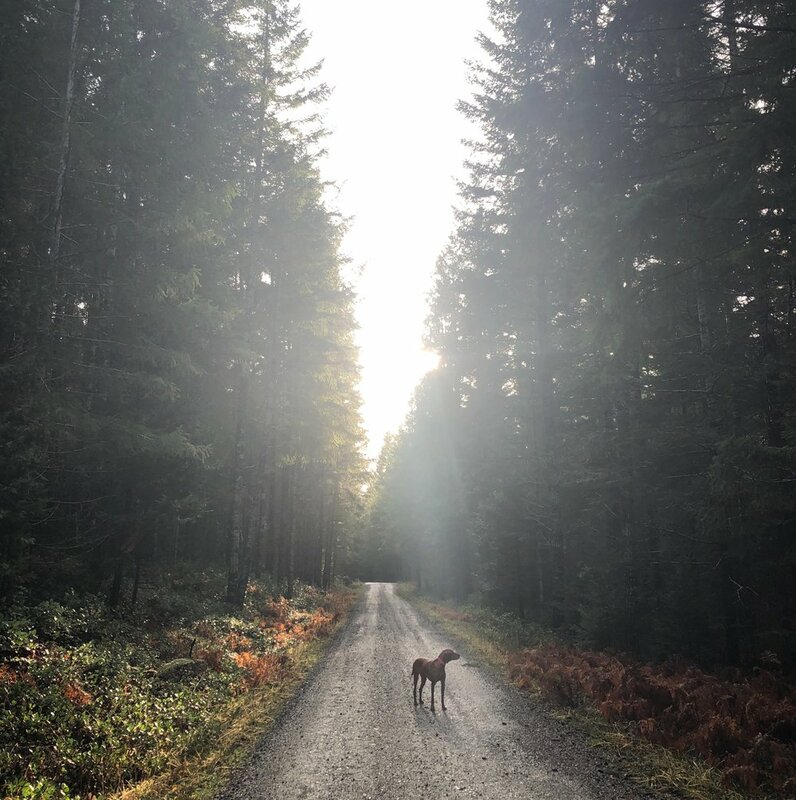 I’ll post about it again before officially sending the first (new) newsletter in January, but if you’re interested you can sign up for the newsletter anytime. If you’re already signed-up for the Simple List newsletter, that will morph into this one—no need to do anything. *I’m a word-nerd and a latin tutor, so the etymology of words excites me. Trivia comes from the latin, meaning three roads or three ways. It’s also the root of trivium, the word we use for the first three of the seven liberal arts (grammar, dialectic, and rhetoric). Check out etymonline.com for their explanation of how trivia came to mean “useless information”. I am a keeper of thoughts and ideas and I’m continually learning how to do that well. They slip away at the margins of too many intentions, too many lists, and too-random interests, and I’ve learned that what is to be kept, must be written. Keeping an actual diary or journal has never gone well for me, though. I get bored with writing down daily details and most of what I end up recording are pieces of events that wouldn’t make much sense later. There are so many different things going on; I find it hard to decide which ones merit ink and paper everyday. In another month or two I will have finished my second bullet journal. Beginning to end, every page will be filled. No more wasted diary attempts, no blank pages left at the end, no fits and spurts of moody brooding or recounting failures. It feels good to complete something that is useful to me in the moment and, when I look at it in retrospect, will give me a real picture of the days and the goals and the highlights. This seems to be working for me. In addition to my bullet journal, I keep a notebook for the tutoring I do with Classical Conversations, a Commonplace Book for quotes, and a notebook for my personal plan of study as I create my own Homeschool MFA (credit for the MFA idea goes to Kortney @onedeepdrawer). I use this traveler’s notebook for my Commonplace and MFA notes. I also have a kraft moleskine stuffed in my Bible for sermon notes and daily reading. I’ve tried keeping all those details within my one bullet journal, but my current thinking is that I like the separate notebooks. And this is my disclaimer that all systems are subject to change and I am ok with that — faithfulness is not the same as dogged consistency. The details of my notebooking madness may only appeal to a few readers, but this blog is also a spot for me to keep track of life. It’s like another notebook. I’m going to lay out the bare bones* of it all here in the hopes it may be helpful to someone else. In my bullet journal I keep my daily lists, appointments, and a flexible list of what meals we might eat that week. Each month I make a page where I can record memories—anything from our daughter returning from India to a special cake we ate or joke we shared. I use my Google calendar to keep track of future events and then transfer them into my bullet journal on Sundays, when I plan the week ahead. I have pages for planning events, notes from webinars or podcasts I listen to, lists of movies to watch, notes on college and scholarship applications I’m helping my kids with; almost everything goes in my bullet journal and gets indexed in the first few pages—one of the best features of bullet journaling. I use this notebook, these pens and these markers, and sometimes this cute little ruler. Keeping a Commonplace Book is something I’ve tried to do for years, since I first heard the idea in Charlotte Mason circles. A commonplace book is simply a place to record quotes and thoughts from my reading, and I’m letting it expand and modernize to include stuff I read and hear online, as well. I am inspired by a hundred different things in a week and the thought of writing them all down helps me narrow what is truly worth holding on to. What do I record in my CPB? Anything on whatever topic is piquing my curiosity at the moment. In The Accidental Creative, author Todd Henry talks about keeping his Big 3 ideas out in front of him at all times—written on a whiteboard in his office and on an index card he carries with him. He describes the Big 3 as the three most important “open loops” in his life and work at the moment, or the things he’s looking for critical insight on. This is not a to-do list or a set of goals. Keeping track of the Big 3 in my life helps direct my reading (which books, articles, essays? ), filtering the stimuli that bombards me, and also serves as a backdrop for conversations I’m having or hearing. Ever notice how sometimes God will bring the same topic before you in what you read that morning, a song on the radio, and a conversation later in the day? That topic is probably one of your Big 3 at the moment. Forget about neat handwriting. The need for things to be perfect and organized and beautiful has been the biggest downfall of my commonplace efforts, making a huge barrier-to-entry for me. I’m a recovering re-writer. I was the student who re-wrote whole math assignments, class notes, and letters to friends until they were symmetrical and neat. If I want to really use my Commonplace Book, I have to deal with it being a little messy. Make time for reading. Every few months I try to schedule a Reading Day to get a big chunk of time set aside, but on a daily basis I am building small habits—15 minutes of reading instead of scrolling, carrying a book with me wherever I go, using the kindle app on my phone. Keep index cards handy. Not every thought from my reading goes in my CPB. Sometimes a quote or idea is for something specific I’m writing or thinking through, so it doesn’t need to be recorded in my CPB but it does need to be documented elsewhere. I usually have an index card in each of the books I’m reading and a few in my purse. When I’m reading on my Kindle, I use the highlight and notes features and transfer quotes to my CPB later. If it’s a non-fiction book (like The Accidental Creative, my current read) I make an outline so I can see the flow of thought and glean every drop. I prefer “real books”, but the lure of owning hundreds more books in a cheap and easy format is real. If it’s a stellar read and one I’ll want to come back to, I’ll order the paper version after I’ve read it on Kindle. That would be my highest compliment to a book: So good I bought it twice. When I am reading an actual paper book, I defile it with my pen, book darts and dog-eared corners. I underline and write in margins and box out whole paragraphs. I am not ashamed. My newest delight is to use Evernote to consolidate my CPB attempts of the past. I got this idea from Mystie Winkler — she’s a genius with organizing and using Evernote. I snap a picture of my notes with the camera feature in Evernote and store it in a notebook called “Commonplace Book”. I have the app on my phone and computer and my files sync across both devices automatically, but the real bonus is that Evernote is searchable, even with my messy, handwritten notes. If I’ve commonplaced a quote with the word “collaboration” in it, I can use the search feature to find it. I’m compiling all my scraps of quotes into one place and when I fill up my current CPB, I’ll transfer all of those pages as well. This way I’ll always have a searchable collection. It’s the best of analog and digital — the benefit of solidifying beautiful words and thoughts in my heart by the act of writing them, and the convenience of having them all in one searchable place. My Homeschool MFA plans stemmed from a convergence of my desire to keep learning, to grow in my writing skills, and my secret dream that someone would hand me a degree for my many years of homeschooling. Seriously. A Master of Fine Arts is a degree pursued by many writers but completely out of reach for me right now — and truthfully — not all that necessary. There is a wealth (a ridiculous, gluttonous overload) of free or inexpensive writing courses and advice available via the internet, and I know I don’t really need a degree to prove or improve anything. I just need an organized plan to keep me accountable. Enter the Homeschool MFA. 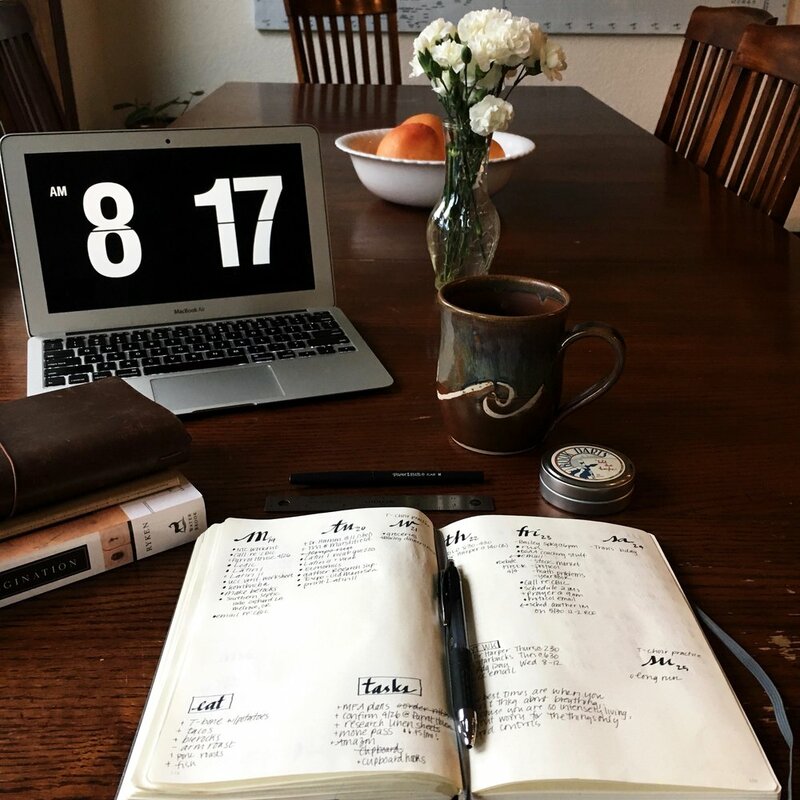 I found Kortney on Instagram and followed one of her posts to her blog, interested in her idea of developing her own "Homeschool MFA" plans, as she called it. It was all pure genius to me. Following her lead, I am being purposeful about what I read, write, watch and listen to, developing my plans week by week and setting some long-term goals to push myself to follow an MFA-esque course of my own making. (Interestingly, I just read some of the exact same advice in Accidental Creative last night.) I’m digging through the plethora of courses available online, making purposeful book lists, setting writing goals, and stretching myself to be a better listener. I’m also giving in to watching more movies, because a good movie is a well-written story. In our promised lands we make plans for bigger and better and we write them, sing them, scribble on napkins the way to the Temple. We want desperately to build up edifices of His glory and a place for the worshippers to come. We see in the greens of spring, and the hope that springs eternal bleeds out of our fingers and we write it. We put it down in permanence, scary and hopeful and open for ridicule. In the end, all that we’ve written become plans for another generation — words pressed heavy in us that will be a balm in their desert and a plan in their Jerusalem. Our children, our grandchildren, for as long as the Lord may tarry, will read our hearts on screens and pages. Our craft will live longer than our lives because His hand presses heavy and they understand in writing what He whispers in our hearts. 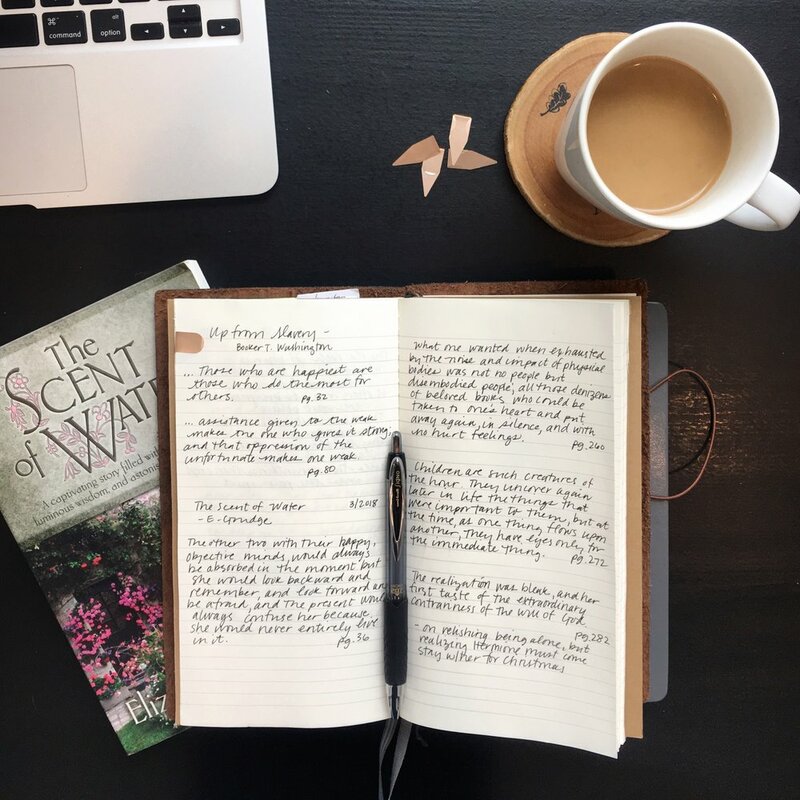 My notebooks are not stuffed full of literary genius and deep thoughts, but in some ways the Lord is making me understand in writing, by His hand upon me, the works of His plans. What might you be missing out on by not writing things down? And what tips, tools, and tricks are you using to record life? Hit me up with all your links in the comments. *Bare bones turned into 1800+ words and my longest post, with the most links, ever. Congratulations if you stuck through to the end!